A recent letter to the editor in il Mattino expresses outrage at the fact that city fathers of Ottaviano, near Naples, want to open a Camorra museum. ("Camorra" is the Naples Mafia.) What are they supposed to display, the writer asks —photos of blood-stained victims? Bullet-proof vests? A list of all the poor people who still have no idea what has happened to their family members? Is this the kind of phony romantic rubbish you want to impress upon the minds of young people who visit such a museum? The politicians, he says, have confused the "Camorra" with the "Carbonari", indeed another secret society, but one of the most important movements in the history of modern Italy. When the Neapolitan Republic fell in 1799, absolutism returned to the Kingdom of Naples with a vengeance. The restored Bourbon monarchy punished the "traitors" severely and infamously and went about 18th-century business-as-usual in the new 19th century. The monarchy was again overthrown in 1806 by Napoleon, who installed his relatives as king—first, his brother and then his brother-in-law, Gioacchino Murat. The subsequent 10-year French rule was, by most accounts, an improvement over the Bourbon monarchy, but it was still an absolute monarchy, held in place by the French. It is during this period that liberal ideas of representative government and eventual freedom from foreign rule went into hiding in the form of the "carbonari", a secret society whose goal was to obtain constitutional liberties for the kingdom. 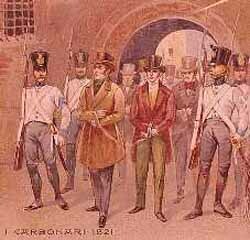 When king Ferdinand returned to the throne in 1815, his kingdom was a nest of carbonari—active and, in some case, armed cells of people from all walks of life —military officers, landlords, nobility, priests, and peasants. They took the name "carbonari" from the trade of charcoal-burning, practiced in Calabria, Abruzzi and Campania. They were divided into Masonic-type lodges and had typically secret rituals, titles, in-group signs of recognition, and an entire vocabulary —a code— taken from the charcoal trade. Their flag was red, white and black, a banner that remained the symbol of liberal revolution in Italy until replaced by red, white and green in 1831, colors still used today on the Italian national flag. After the restoration of the Bourbon monarchy, they grew in strength and were the focal point of the 1820 revolution that for a time, at least, succeeded in wringing a constitution out of the autocratic Bourbon ruler, Ferdinand I.
Liberal-revolutionaries openly hostile to the state and forcing constitutions on kings was not what the Congress of Vienna had had in mind in 1815 when it ended the Napoleonic interlude by restoring the old order in Europe. A new Congress was convened in Troppau in 1820 to deal with the crisis. It gave the King of Naples the authority to seek aid from Austria. He left Naples after swearing an oath to the constitution, hastened to the Austria of his old Hapsburg in-laws (his first wife Caroline was a daughter of the empress Maria Theresa) and returned with a 50,000-man army to put down the rebellion. They were met by a Neapolitan force of 8,000, which they defeated at Rieti on March 7, 1821. A few days later the King returned to Naples in triumph—at the head of an Austrian army. He dismissed parliament and tore up the constitution. The inevitable trials of "traitors" ensued, followed by the inevitable executions shortly thereafter. It is from this date that a constant foreign presence in Naples—either the Austrian army or Swiss mercenaries—was necessary to support what had become the last bastion of absolutism in Europe.